Comic Tom Green; Shaed performs; actress Lyric Lewis. Perhaps not since last summer's trailer for "Marmaduke" has a two-minute clip left us feeling so sad, angry and confused. 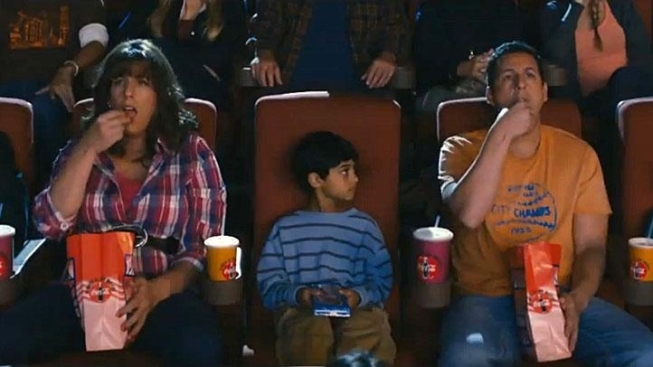 "Jack and Jill" is an upcoming comedy starring Adam Sandler playing a man, Jack, and his own twin sister, Jill, and the first footage suggests that the end result is as bad as the idea itself. Of course Sandler plays a regular guy with a beautiful wife, Katie Holmes, and a couple of kids, and his sister is a brassy loudmouth who comes for an overlong visit, driving him crazy. And if that isn't bad enough, the film co-stars Al Pacino (yes, Al Pacino) as himself. Upon spotting Jill at a Lakers game, Pacino is so smitten that he has a hot dog sent over to her with a his phone number written in mustard and ketchup. All we can say is that these guys had better been doing some seriously life-changing charity work with the money they make on this film. "Jack and Jill" opens Nov. 11.